Improve reading comprehension skills with high-interest passages that meet the expectations of current state standards. Paired Passages for grade 5 features compelling material that students compare and contrast so that they can integrate knowledge and ideas across multiple texts. Designed to keep young minds engaged, this series strengthens comprehension skills and students' ability to think critically. 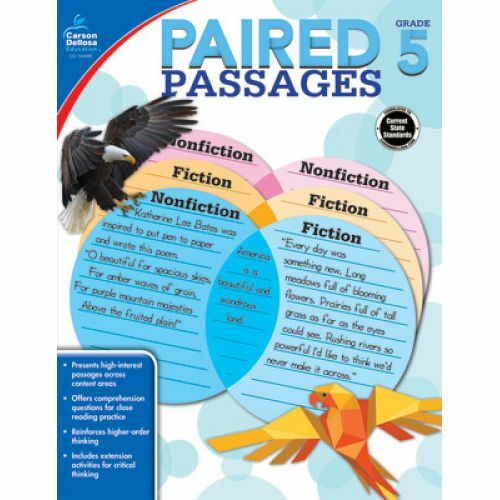 Paired Passages for grade 5 offers pairs of nonfiction and fiction passages for students to compare and contrast. Aligned to state standards, students will read high-interest passages about topics such as Babe Ruth, Kwanzaa, Hanukkah, a Robert Frost poem, and more. When students finish reading a pair of passages, they will rely on the text to complete the accompanying questions and activities. Each topic features a pair of passages and is followed by two pages of text-dependent questions and activities. By using this research-based instructional approach, you are preparing students for a successful academic journey this year and for years to come.